It must be football season because I dreamed about Bob Stoops last night. For those who don’t know, Stoops is coach of the Oklahoma Sooners. I hate the Oklahoma Sooners. They’re like the evil Pied Pipers of Texas, luring our high school football players across the Red River, and who knows what happens north of the border. The bad thing about my dream was that Stoops was a nice guy. He, one of my sons, and I were actually planning an IT startup together. It was all cutting edge; we were building a new thing called a personal television that was big and boxy. OK, dreams can be really strange. The main thing was this: What was Bob Stoops doing in one of my dreams posing as a nice guy? Very frustrating. The Dallas Cowboys, that’s the players not the owner. I grew up with Tom Landry, Don Meredith, Bob Lilly, and Roger Staubach. I grew to like Jimmy Johnson because I like to win. I never liked Jerry Jones because the first I heard of him he was firing Landry. Then, he couldn’t get along with Johnson. No Super Bowls; no love. The Texas Longhorns because my Dad loves them, took me to some games when I was young, and always watched them on TV (when they were on in the pre-cable days). I was in the Cotton Bowl on Jan. 1, 1970, when the Longhorns beat Notre Dame for the national championship. I was not there the next year when they lost, and I think my absence is why. The Baylor Bears because they’re Baptists. My dad taught me to pull for them because of their faith, except when they played the Longhorns, which is when faith didn’t matter. I like the Bears more now because they actually win but more so because a friend gave me four tickets to a game a few years back and thus made a monster Bears fan out of my youngest grandson. Where my grandchildren go; I go. The Texas A&M Aggies, sort of. My dad taught me to pull for Texas teams when they play out of state, and that’s what the Aggies do now. So I pull for them. But if they ever get up the gumption to play Texas or Baylor again, or if they get forced to do so by a playoff system, then my older loyalties rule. The Green Bay Packers because two of my daughters love these guys. Let me clarify. I hate the Packers of the 1960s because they beat Dallas in the NFL championship games before Super Bowls I and II. Do not mention the Ice Bowl or I start having problems dealing with reality. I only like the Packers of Reggie White, Aaron Rodgers, Clay Matthews, and Jordy Nelson (ouch, that knee injury hurt). The Georgetown Eagles because I now live in this town, and any self-respecting Texan pulls for the local high school team. Ohio State because back in the 1960s Texas and the Buckeyes seemed to always be numbers one and two in the national polls, and Dad said it was because the sportswriters and coaches had a Big Ten (read Yankee) bias. I always told him it wasn’t so, but sons will sometimes argue points they don’t really hold. My son-in-law grew up a Buckeyes fan, but he’s late to the game; my opinion is already set. Washington Redskins because they play the Cowboys twice a year. For some reason, I don’t dislike the Philadelphia Eagles or New York Giants quite so much. I think the reason is that the Redskins uniforms are uglier. By the way, uniforms matter. The Cowboys’ unies are major cool. The Cincinnati Bengals and Tennessee Titans need a new tailor if they ever want respectability. Any team that plays my teams, except when my teams play each other in college football. There is actually no spiritual meaning to this post whatsoever. No, wait; I’ve got something. If we want to evaluate our spiritual lives, compare it to our football lives. Do we get passionate or do we go to sleep? Enough said, I suspect. I need to pray. And, by the way, I never pray for football wins; my dad taught me better than that. Curry Fever overtook me quietly as I sat watching my first game of Golden State Warriors playoff basketball. Before the game ended I had experienced a flashback to my days in Illinois and the Michael Jordan hysteria that gripped so many of us in the 1990s. Stephen Curry is an amazing basketball player. I’m not a big NBA fan; it’s casual fandom for me. After Jordan, the game bored me. Then the Dallas Mavericks captured some magic, if less beautiful and exciting, but then their franchise let the guys who won them a championship go. My interest waned. I pulled for the Spurs to beat the Heat last year, but that meant watching one series of NBA playoffs out of oh so many games. The uprising starts innocuously. A ragged warmup, a swollen deficit, a sidelined teammate … a hard foul, a gnawed mouthpiece … a shot off the back rim, a smirk, a correction … a wet jumper, and another, and a feeling … a pull-up in transition, a one-legged leaner, a moonbeam from 27 feet … a high-step, a shoulder-shimmy, a point to the rafters … a mandate from the court, the bench, the stands: “Give him the ball!” … coaches scrapping rotations, opponents draining timeouts, fans spilling beers … a delirious bench, a traumatized defense, a basketball arena turned tent revival … and the 6’9″, 190-pound pixie in the middle of the madness, thinking only about his read on the next pick-and-roll, because if he ever allows himself to savor any of this, it will be gone. First and foremost, I have to thank my Lord and Savior Jesus Christ for blessing me with the talents to play this game, with the family to support me, day in, day out. I’m his humble servant right now and I can’t say enough how important my faith is to who I am and how I play the game. Curry revealed some other telling things in that speech. He thanked lots of people by name – wife, mom, dad, brother, sister, best friend, coaches, teammates, team brass – and he drilled so deep into relationships that he mentioned and commented on the equipment guy and the security man. He didn’t just slide over their names; he found them in the crowd, recalled moments of care, and laughed. Curry seems to care about people, and not just the famous and powerful. In a video testimony on the Active Faith web site, Curry talks about how his faith life began. My parents had us in church every Sunday, every Wednesday. It was more of a tradition at that point; I didn’t have a personal relationship with the Lord until I went to the altar call one Sunday and the youth pastor told us to make a decision for ourselves. The youth pastor told us we had to make a decision for ourselves, we couldn’t rely on our parents. It had to be a decision on our own, and that’s when I made it. The biblical book of James notes that faith in Christ shows in how we live our lives. Too many people have “made a decision” for Christ, but have chosen not to really follow him. Curry is yet another example of what it means to be a true disciple of Christ – there is a personal decision, and then your life shows the decision has made a difference in how you live. You’re not perfect, but you want to go in God’s direction. Ethics is about how we live our lives; Christian ethics is about how we live our lives for Christ. Stephen Curry is playing better basketball than anyone else in the world right now, and he’s fun to watch. The rest of us are not on such a visible stage, but maybe Curry can inspire us to do our best in our part of the world and to give God the glory when we achieve. Find your own chest pound and finger to the sky; let others know there is more to what is happening in your life than meets the eye. But remember that what we do – what others see – is also important. A violent man is coming to Dallas. He didn’t simply pick North Texas as a good place to live; a wealthy family in the city offered him $11 million to come to town. Greg Hardy is indeed coming to Big D. Hardy will be the newest pass rushing “savior” of the highest profile American football team, the Dallas Cowboys. Hardy, however, has a past. Last year, a judge found him guilty of assaulting and threatening to kill his girlfriend. Hardy then requested a jury trial, which never happened because the girlfriend would not cooperate with the prosecution. She, instead, accepted an out-of-court settlement. In my neighborhood, we would say Hardy paid her to keep her mouth shut. Now Hardy can go back to doing what he does best – rushing quarterbacks, at least after the NFL punishes him in some way for what he did. Hardy is a violent man in a violent game. But football is no longer just a game; it’s a business where men get paid a fortune to destroy one another. I love football. I plan my autumn weekends around it. I get emotionally wrapped up in certain teams. There’s just something about American football that is like no other sport. But I’m not a violent guy. I haven’t been in a fight since grade school, and the last time I physically tried to hurt someone was 35 years ago in a softball game when I threw an elbow to the first baseman’s ribs. Oh, wait, 15 years ago, I intentionally fouled a better soccer player twice before being caught. Maybe I’m a violent guy after all. It’s lurking beneath the surface of my calm, aging, less-than-hulking exterior. The Bible chronicles the violence of man in the earliest days of existence. There is something in our makeup, which bends people toward violence – some do their violence physically, others do it emotionally. Hardy is not alone. There is a violence in all of us that needs to be tamed, and God desires to help us tame it. Our Christian prayers should be for Greg Hardy as a man. He apparently has done some heinous things. Let’s pray he realizes it’s wrong to strike another person, that is when said person is not on a football field. We can kind of see how a person with a certain disposition and a lack of moral constraint could fail to learn there is a difference. I am encouraged that there are men playing football who are not violent off the field. I think of the late Reggie White, who played the same position as Hardy, and there are more. For them, football provides an important release for violent impulses. They are taking out their energy and aggression on other people of roughly the equivalent size and strength who have chosen to do the same thing. Domestic violence is such a cowardly act. Most domestic violence is committed by men. We need to do a better job of helping boys learn early that striking another person, especially a woman, is wrong. And, frankly, this has to start with their dads and other men in their lives. Men, never strike a woman. But also, women, never strike a man. If you want to hit something, go outside and play some football with someone of your on size and gender. And, yes, some women can play. Flashbacks can be scary. Within a 24-hour span, I have gone back in time twice. Sunday night, I began to care about the Dallas Cowboys again. I started getting actual emotions about it. And then they reminded me of why I had become emotionally detached–they again were Jerry Jones’ Cowboys and not Tom Landry’s and Jimmy Johnson’s Cowboys. But what really scared me was that it made me angry, just like the old days when I wore my Cowboys love on my sleeve. Yes, even the great Cowboys teams lost on occasion. It’s not good to talk to me much when I’m angry. Then, Monday night, I began to care again about the Texas Longhorns. My orange pride surfaced as the Texas footballers faced what looked like a bunch of pansies with their stylish uniforms. But the Longhorns didn’t play like Texans ought to play their national sport. They were slower than the Ducks, less sophisticated than the Ducks, and out-quarterbacked by the Ducks. Texas high schools produce more top flight quarterbacks than any state and yet our state university didn’t seem to get one. I got football angry for the second time in 24 hours. I don’t get angry much, so why does the play of some essentially meaningless games get under my skin? Gosh, I hate football. Oh, but I also love it. I’m not sure completely why, but following the game of football is both the most frivolous thing I do and one of my great passions. Give me talk about religion, politics, and football and I’m a satisfied man. With my football addiction revealed and my football anger confessed, I do at least take some comfort in my two newly adopted teams–the Baylor Bears and the Green Bay Packers. Green and gold look better and better to me all the time, but I think somewhere deep inside me that Cowboys blue and burnt orange will always have a place. Yuck! Associated Press writer Tim Reynolds has said it, and the rest of us feel it. The Cowboys have been supplanted. “Sorry, Cowboys – your long-held moniker might have to be ceded to your city’s NBA club,” Reynolds writes. Many of us felt the Cowboys no longer deserved the title, now a new team has captured the national imagination the way the Cowboys once did. As a fan of both, I’m not necessarily happy to see the Cowboys dethroned, but they’ve really brought it on themselves. But to heck with the Cowboys, let’s enjoy this moment. Tim Reynolds captures so much right about this team in his story, which I found on the Miami Herald web site. “Hating the Heat became the NBA’s craze this season, and the team knew it had no shortage of critics, everyone from Cleveland (where “Cavs for Mavs” shirts were popular during these finals) to Chicago (the city James and Wade both flirted with last summer) and just about every place in between lining up to take shots at Miami,” Reynolds writes. “We could feel it,” Mavs Coach Jerry Carlisle said, noting he was repeatedly told during the finals that “billions” of people wanted to see Dallas topple Miami. 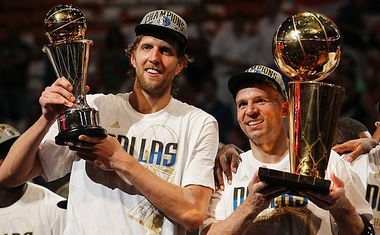 But forget the Heat hate; the Mavs are a team to make you proud, just like the Cowboys of the 1970s. They do things right — work hard, play tough, and show class. It’s a return to old school sports. Let’s enjoy it while we can. Go Mavs! I used to say my blood runs Cowboy Blue, as in the Dallas Cowboys’ famous star. I have since undergone a transfusion of sorts. I didn’t replace Cowboy Blue with Packer Green as one of my daughters would have me do; I’ve simply switched to Passionless Red. In other words, the professional football passion has gone out of me. It’s not just that the Cowboys are losing, it’s why they are losing. They are losing because they have become the Dallas Jerry Joneses. They are an extension of a man who has the potential to be a great owner but who is driven by ego and image to the point that there is no place for team and substance. I started following the Cowboys before they were winners back in the early 1960s. They became America’s Team over the years not just because they won but because of how they won. They were an organization, not a one-man show. There was the invisible Clint Murchison as owner, the marketer Tex Schramm as general manager, the chess master Tom Landry at coach and the find-players-under-a-rock Gil Brandt at player personnel director. And those top people put top players on the field and prepared them to play. Winning followed. The play on the field was exciting, but it was the work behind the scenes that made it possible. Jerry Jones got lucky in his first few years because he was teamed with Jimmy Johnson and because the Minnesota Vikings were idiots in trading their future for one Cowboy. It’s been mostly a debacle ever since. I really like many of the current Cowboys players, but they deserve a better organization. Jerry Jones, for all of his talk, cannot give it to them; rather, he will not give it to them. Murchison-Schramm-Landry-Brandt would make the current players Super Bowl champions. Peter King wrote earlier this year that the Cowboys have always mattered. They really don’t matter any longer. The Patriots are the Cowboys of today because they have organized themselves for success, and they just keep executing it. I will probably continue to watch Cowboys games, but they just don’t matter much to me anymore. My wife can remember the days when a Cowboys loss would ruin my day. No more. I just don’t want a rich egomaniac to have that kind of power over my life. So who do I pull for now? There are the nearby Houston Texans. There are the well-coached Tennessee Titans. There are the Colt McCoy-led Cleveland Browns. There is the people’s team, the Green Bay Packers. But I just can’t go with that last one; I still remember the Ice Bowl.